Free version. Only works on EURUSD. 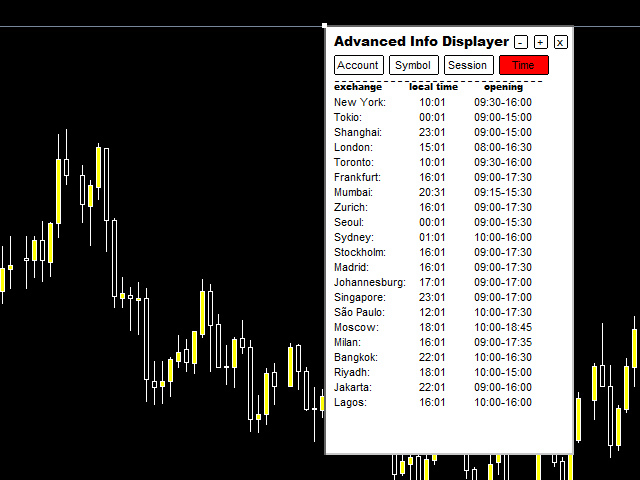 Would you like to have statistics about your trades displayed while you operate? Have you a solid understanding of the symbol you are trading? Do you really know everything you need to about your trading account? Do you need to keep an eye on the local times around the world? Advanced Info Displayer answers to all that. It is the ultimate tool to know all sort of useful information and hidden or hard to find data. It is important if you are serious about trading and you value statistics and maths. 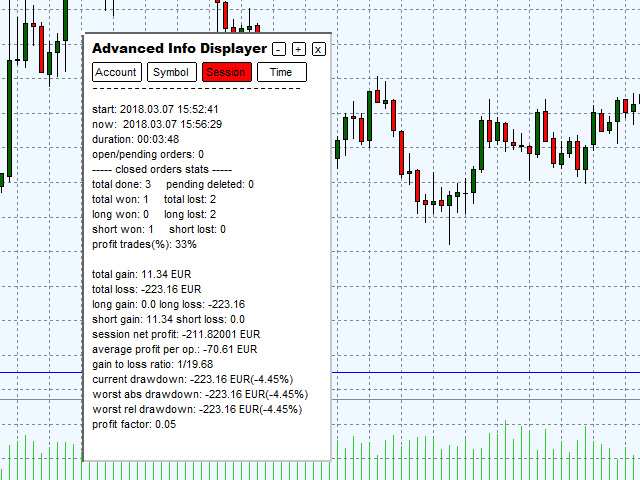 (Session) net profit, profit factor, profit trades(%), average profit per op., absolute drawdown, relative drawdown, etc. (Symbol) pip value, tick size, min lot size, max lot size, change (24h), change (1 month), change (1 year), day high, day low, month high, month low, etc. (Account) leverage, max orders, permission to use expert advisors, server time, margin used, margin free, margin call level, stop out level, etc. All of that is displayed in a customizable window you can move around and minimize to you liking. Please note that if you change period, your session stats will be lost. 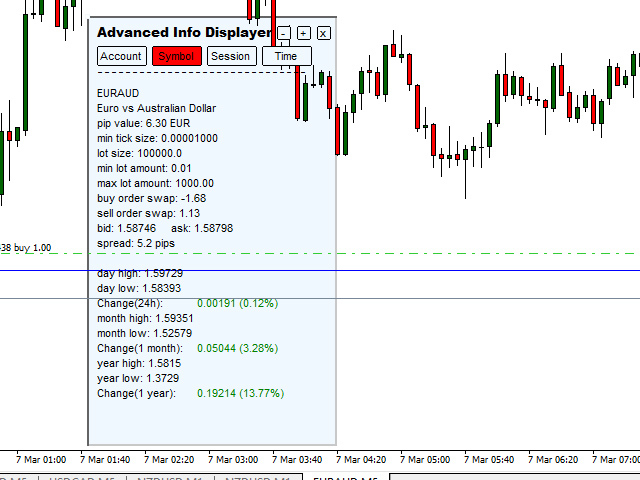 Therefore, if you need to elaborate statistics on, for example, EURUSD M1 and EURUSD H4, you must open those 2 chart windows, place the indicator on one of them, and set input value "compute_only_current_chart_stats" to false.